Nowadays, “PUBG Mobile: Stimulus Battlefield” has two maps for players to choose from, one is the lush Jedi Island and the other is the endless desert of passion. No matter what kind of map, there is water. Among them, the relative passion desert area in the waters of the Jedi Islands is larger. In some cases, players need to access the water from outside the safe area. If they avoid the water, they may spend a lot of time, which delays the opportunity to enter the safe area and is seized by the enemy. There is a certain degree of risk in swimming and walking the water, because in the water, you cannot use firearms to fight the enemy. If you are discovered by the enemy, you will only become a target. So how to swim can reduce the possibility of being discovered by the enemy? To safely reach the shore, the players cannot naturally run into the water. Regardless of disregard. Have been immersed forward, waiting for you is likely to shoot a bullet, then the tragic water, eliminating the game. Choosing the right type of swimming at the right time will not knowingly reach the other side and hit the enemy by surprise. When the player has just walked into the water, the walking speed will decrease. This situation is like a quagmire and it is difficult to move. If the player does not have a good sense of preparedness, after being discovered by the enemy, the possibility of being defeated by the enemy is greatly increased in case of inconvenient mobility. Therefore, when the player enters the water, he should keep his body moving forward and observe the surrounding conditions. Once the enemy is found, consider how to do it according to his own situation. If the enemy hasn’t found you yet, slowly retreat backwards, withdraw from the water as quickly as possible, and quickly make other evasive or offensive moves against the enemy’s position. If the enemy has found you and is ready to shoot you, it is too late to withdraw from the water. 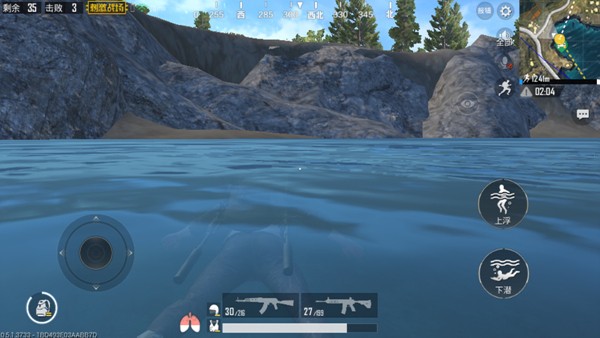 Players must quickly submerge their bodies, maintain their diving status, and then quietly move away from this place, choosing a suitable landing site. Ashore. During the movement in the water, you can breathe out for a short time, adjust the breathing, and avoid dropping blood due to a long dive time. When the player is completely in the water, refer to the operation method for selecting swimming during the game. In the early stages of the game, most people are busy picking up resources. Few people will be dormant on the water’s edge. At this time, players can safely swim forward, reach the other side as fast as they can, and go to nearby houses to obtain resources. 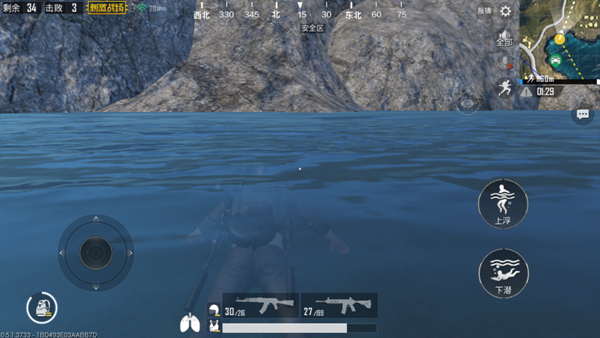 If you hear car sounds or footsteps during this period, you don’t need to panic and immediately dive into the water and observe the situation . In the later stages of the game, there are fewer remaining players. If the player is still brazenly swimming in the water, Obviously it is wrong. In the process of swimming, players need to float and dive to alternately use two buttons to keep breathing smooth, but also allow themselves to be in the water “simply looming” and not easy to be discovered by the enemy. Even if found, it is difficult to be hit. When the player is about to approach the shore, he/she needs to pay attention to the situation. When it is still in the water, watch the position of the houses on the shore, and make sure that everything is in motion. In a safe situation, the player should also roughly estimate how far away he is from the house and formulate a corresponding route after going ashore. If there are enemies, then the player will have to hold his breath, which is to approach the shore in the form of diving, and then wait for the opportunity to go ashore. 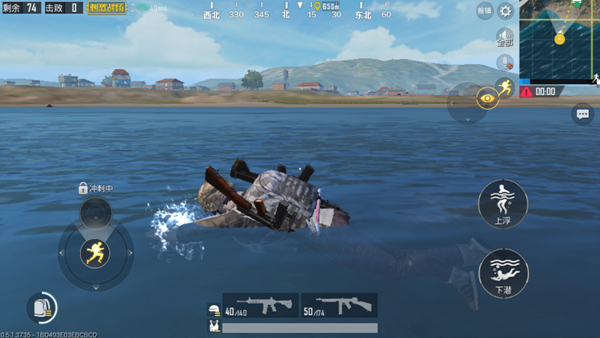 Although the player does not pass through the water in every game, it is still necessary to master the swimming skills. Increase your own strength, naturally will increase the chance of eating chicken. Sometimes passing through the waters is more likely to make the enemy unguardable. Of course, there may be more different situations in the process of swimming. At this time, the player must stay calm and change his strategy according to his own situation. 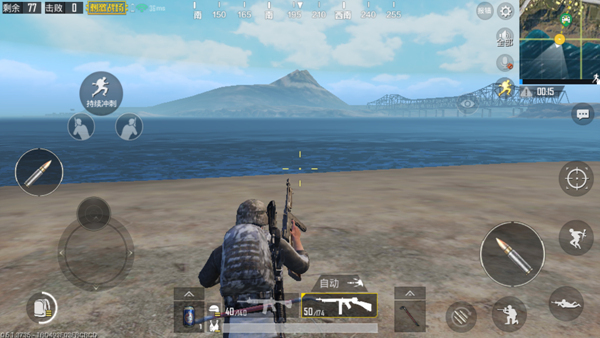 What should I do if the PUBG Mobile guide does not reach the firearms?